Crowns are sometimes called caps and will completely cover up, or cap a tooth right down to the gum line. They are used to protect teeth that have lost a significant part of their structure either to decay or trauma, and can be made from various materials. Your crown can be constructed from a metal alloy that is covered up with porcelain, or it can be made entirely from ceramic materials. All-ceramic crowns are metal free and offer the best cosmetic results due to the way they are able to transmit light right the way through the crown without the obstruction of metal. Bridges are used to bridge the gap left by missing teeth, and can be used to replace one tooth or multiple teeth. The bridge is supported by crowns on the adjacent teeth which are then attached to the replacement false tooth to form a strong and stable restoration. Your bridge can be constructed from the same materials as crowns and even a complete arch of teeth can be metal-free using the very latest zirconia frameworks that are covered up with natural looking porcelains. All crowns and bridges provided at our practices are Australian made premium quality products made by local small volume high quality labs. This costs our practice more but you will still find our pricing to you competitive. We believe using poor quality overseas made products costs both the patient and our practice more in the long run. 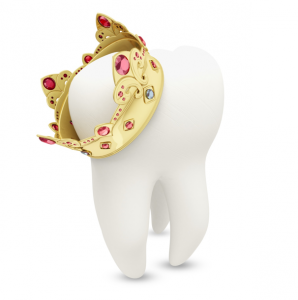 What Is the Procedure for Having a New Crown or Bridge? The procedure will usually require two appointments at either our Practice. Your dentist will need to prepare the teeth due to be crowned through carefully shaping them before taking an impression of your mouth. This is sent to a dental laboratory so your crown or bridge can be fabricated to our exact prescription. A temporary crown or bridge is made and placed so that the prepared teeth look normal while the laboratory fabricates the final crown or bridge. Once it is ready you can return to our practice to have your new restoration fitted and adjusted if necessary. The final step is to cement it in position.